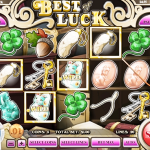 Best Of Luck is a very generous slots game. It is basic and very easy to play and with some luck you could earn 10000 coins with a single spin! Not bad huh? The wild cards are the thing here. They bring the biggest returns. All the others are not really interesting. The thing is that with the a very small coin range you could wait patiently and keep spinning till you get the wilds that you really want! 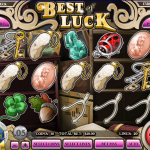 Best Of Luck is very basic and so are the bonuses. 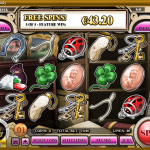 You can only get free spins which are great because they usually return the biggest wins. The max free spins you can get is 6 and there’s no multiplier or alternative screen. Best of Luck is fun and rewarding. Apart from that there isn’t really much to say about it. If you want to test the waters with a fun and rewarding game then maybe this is the game for you but you wont get the rush or level of interest that other games might bring you. Love 5 reel slots? Try Aussie Rules, a 5 reel slot by Rival.